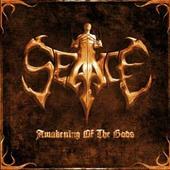 "Awakening of the Gods" is the first album from Seance since 1993. This is old school thrash mixed with early death metal, not far off from prime Kreator and Slayer. But Seance manages to blow off the dust and rev up a bit as they take the sound at least closer to today's style. It took about three songs for me to really get into this but, eventually, I was convinced. The band has an intense style and attack their songs with all the brutality they deserve, although they are not much more original more than other acts of this style. Seance certainly doesn't play a very complicated style either. So how are the able to pull off such a blistering release? I think a large portion of the credit must go to the band's use of heavy distortion, lower tuning, severely raw vocals and some fine production work. At their best, Seance manage to keep everything interesting without sacrificing their edge. They know how deliver tight choppy riffs and keep the pace going steady throughout. Most of this may have done before, but that doesn't take away from the fact that Seance have delivered a powerful album full of the kind of thrash that is playing over and over. For more information, check out http://www.myspace.com/seanceseance.